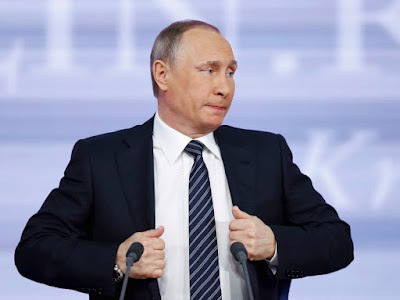 MOSCOW, Russia -- After months of denials, Russian President Vladimir Putin admitted for the first time, Thursday, that his country’s military is operating in separatist-held eastern Ukraine. Russian President Vladimir Putin attends his annual end-of-year news conference in Moscow, Russia, December 17, 2015. "We never said there were no people there who were carrying out certain tasks," Putin said during his annual end-of-year news conference in Moscow. Putin said Russia had no regular troop presence in eastern Ukraine but, in response to a question about Russian servicemen detained and injured in the fighting, he admitted that "certain matters, including in the military area" were being performed. "We are interested in resolving this conflict as soon as possible," Putin said. “He said that Russia has personnel in eastern Ukraine and this personnel, they have conducted military activities. That is what we normally call ‘soldiers,’” Stoltenberg said. Putin’s admission “underlines the special responsibility of Russia when it comes to the full implementation of the Minsk agreement,” he said. That cease-fire agreement, reached in the Belarus capital, calls for the withdrawal of heavy weapons, the withdrawal of foreign troops (in this case Russia’s), ending hostilities, changes to Ukrainian law and local elections in separatist-held eastern Ukraine. "If we really want to resolve the problem, let’s stop this, let’s work together," he said. The fighting in eastern Ukraine began in April 2014 after popular protests in the Ukrainian capital, Kiev, ousted a pro-Russian president and installed a new government that has sought to improve ties with the West. Pro-Russian separatists, armed with tanks, multiple missile launchers and artillery, seized two regions in the east close to Russia. The U.S. government, NATO and non-governmental observer organizations have cited evidence that the weapons were supplied by Russia and that Moscow also sent troops to help the rebels. An estimated 9,100 people have been killed and more than 1.3 million displaced as a result of the conflict, according to the State Department and United Nations. Russia’s economy is expected to contract by 3.8% in 2015 due to low oil prices and European Union sanctions over its intervention in Ukraine. Putin wants those sanctions lifted. Poroshenko accused Russia of implementing a "growing military presence” in eastern Ukraine. Putin’s comment Thursday is reminiscent of his admission in March 2014 that he ordered the military operation to seize Ukraine's Crimea province, weeks after denying that soldiers who occupied buildings and set up checkpoints around the region were acting under Russian military orders. Whether Putin's acknowledgement of Russia's role in eastern Ukraine will lead to greater determination to implement all terms of the Minsk agreement is unclear, but he apparently hoped to signal that he will cooperate, said John Herbst, a former U.S. ambassador to Ukraine who’s now at the Atlantic Council think tank in Washington. “My guess is the pain Russia has experienced between oil prices and sanctions and the fact that they’re not doing that well in Ukraine has persuaded them to be more reasonable,” he said. Ivo Daalder, a former U.S. ambassador to NATO who is now president of the Chicago Council on Global Affairs, said there's a more ominous message in Putin's words. It's "an admission of the violation of international law," Daalder said. "It sends a message to Kiev that he doesn't care anymore that the international community knows."